Some notes on the influence of anarchism and anarchists in the Philippines, written in 2004. Anarchism was been a widespread political belief worldwide since the industrial revolution in Europe. In East Asia we had histories of anarchist uprisings and anarchist movements that radically developed the political conciousness of the common people in Japan, China and Korea. The Shanghai Commune was organised by Chinese anarchists before Mao Tse Tung came into power, while the Korean Anarchists formed a cooperative commune in some parts of the Manchurian area as their answer against the Japanese occupation. Japanese anarchists are one among the collaborator of this succesful cooperative of workers and peasants in Korea. they organised it while they fled from the Japanese Authorities who commanded to arrest and kill all anarchists in tokyo and some parts of Japan after the rice riots. While the anarchist movements in East Asia were very vibrant during the two World Wars, in the Philippines, south east of Asia... the resistance against foreign occupation was also overwhelming. but during the famous Philippine revolution against Spain there were prominent intellectuals and key persons to the revolution who were briefly influenced by the anarchists in the west. In Benedict Anderson’s lecture about his suspicion that the famous Filipino intellectual Jose Rizal was influenced by the revolutionary anarchists during the period of 1800’s while Rizal was staying in France finishing his two famous books that believed to be the spark of 1886 Philippine revolution. In his lecture, Anderson pointed it out that it was not Rizal who was directly influenced by the anarchists in Europe but Rizal used some anarchist characters in his book/novel to portray the metaphor of revolutionary uprising against Spain and the Friar system in the Philippines. Meanwhile, after several years since the Philippine liberation against Spain was realised there was a Ffilipino named Isabelo delos Reyes who organised the very first militant trade union movement in the Philippines and it was organised under the influence of anarcho-syndicalist organising which inspired him during his long stay in Spain and his brief involvement with the anarchist civil war of CNT. But eventually, it was the Communist Party of the Philippines (PKP) that was organised as the political backbone of the very first Filipino militant trade union movement. The essence of anarchist principle naturally died down as the marxist-leninist philosophy dominated the conciousness of the Filipino working-class. 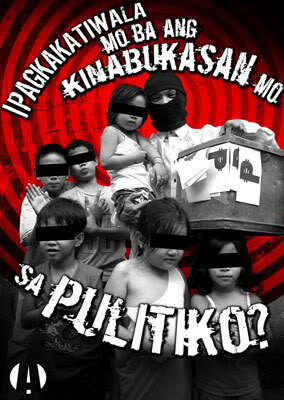 Until now, I am still looking for some traces of old anarchist practices in the Philippines. Recently, there was an anarchist network organised in the big area of Manila. This network is more into the pop-anarchy character, since most of its prime movers are into punk subculture. Well, there were also some of them who came from the prominent left and decided to work within the anarchist principles, but, the political maturity is still an undergoing process and part of this process was the disolution of the network itself. Anarchism in the Philippines has still a long way to go.